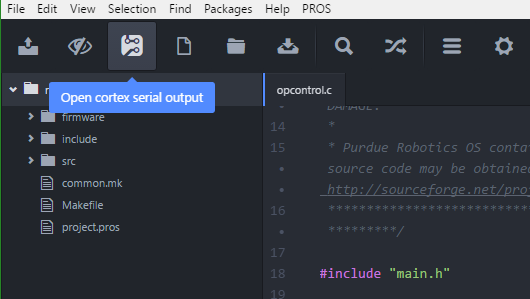 The PROS API provides various functions, like print() or printf(), that allow your robot to output information to a connected serial console during operation. Running pros terminal on the command line will open an output stream from a robot connected over direct USB connection, VEXnet, or JINX. A terminal panel will open at the bottom of the screen containing the output of a connected robot. Serial Port: May vary; unplugging and replugging the VEXnet device from the computer should allow you to determine the correct port.